5 Things To Watch In Tuesday's Primaries : It's All Politics Primaries in Indiana, North Carolina and Ohio serve as the kickoff for an intense two-month stretch of elections. Did we mention former American Idol star Clay Aiken is on the ballot? North Carolina Republican Senate hopeful Greg Brannon (left) greets Adam Love and his daughter Gwendolyn Love during a campaign event in Charlotte, N.C., on Monday. Get ready for election season. Tuesday's primaries in Indiana, North Carolina and Ohio serve as the kickoff for an intense two-month stretch that will go a long way toward outlining the shape of the midterm election landscape. By the end of June, more than half the states will have conducted their primary elections. And the answers to some of the most important questions about the November elections will be clearer. In North Carolina, Republicans will vote for a nominee to take on Democratic Sen. Kay Hagan, one of the nation's most vulnerable incumbents. In Ohio, House Speaker John Boehner goes before GOP voters and gets a chance to prove that conservative unrest with his leadership doesn't extend to his backyard. There are a handful of other House races to watch in those states and in Indiana, providing an early glimpse into the depths of voter discontent with incumbents. Does House Speaker John Boehner have anything to worry about in his Cincinnati-area district? No. He has won his last two primary elections by landslide margins and has spent close to $12 million so far this election cycle. Compare that to his unknown opponents, who have spent almost nothing. Still, Boehner's victory margin is worth watching in his safely Republican district. He leads a GOP-controlled House that has hit record levels of unpopularity and has faced sharp criticism from fellow conservatives over his leadership. Anything less than a runaway win will raise eyebrows both in Washington and back home in Ohio. North Carolina's crowded GOP Senate race is perhaps the most closely watched contest Tuesday. Recent polls suggest three candidates are in the hunt for the nomination: state House Speaker Thom Tillis, the best-funded Republican candidate thanks to support from the GOP business and donor class; Greg Brannon, who hails from the Tea Party wing; and Mark Harris, a pastor with evangelical support. According to a Public Policy Polling survey released Monday, Tillis is the front-runner with 40 percent of the vote. But the exact percentage matters here — in North Carolina, the top finisher in a primary needs to win at least 40 percent to avoid a runoff. If Tillis is below that mark, the outcome won't be decided until a July 15 runoff — meaning Republicans could face a bruising and costly two-month runoff. While outside groups would likely continue to attack Hagan during that period, a runoff will still deplete the campaign treasury of the ultimate GOP nominee and could exacerbate intra-party rifts. The Republican Senate race in North Carolina has attracted the interest of some of the top names in GOP presidential politics — past and present. Mitt Romney and former Florida Gov. Jeb Bush have thrown their support to Thom Tillis; Kentucky Sen. Rand Paul is backing Tea Party favorite Greg Brannon. Then there's former Arkansas Gov. Mike Huckabee, who has supported Mark Harris by helping him raise money and recording a get-out-the-vote phone call for his fellow Baptist minister. The involvement of GOP A-listers highlights the high stakes of the GOP primary — and the interest of potential 2016 prospects in shaping the Republican Party going forward. Remember Clay Aiken, the American Idol runner-up from a decade ago? Well, he's running for Congress as a Democrat in North Carolina. Don't laugh. Aiken has great name recognition from his showbiz career and has turned out to be a pretty decent candidate for a political newcomer. But Aiken is still something of a longshot. For starters, he has stiff competition in the Democratic primary. And even if he does win Tuesday, November is an even steeper uphill climb — he's running against a GOP incumbent in the comfortably Republican 2nd Congressional District. The bulk of House incumbents on the ballot Tuesday are expected to skate to victory. 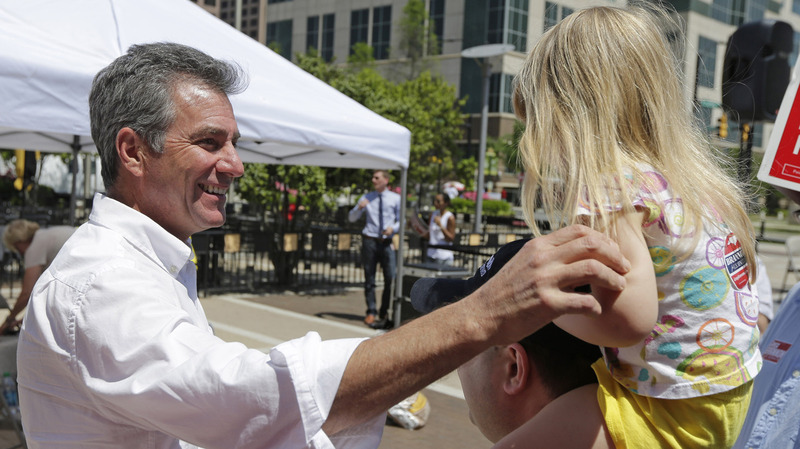 In Indiana, Tea Party challenges largely fizzled, leaving the state without much action. But in Ohio and North Carolina, there are two races worth watching, one in each state. In northeast Ohio, freshman Republican Rep. David Joyce is fighting off a vigorous primary challenge from state Rep. Matt Lynch, who contends Joyce isn't conservative enough. Joyce's voting record isn't wildly out of step with his district — which leans Republican — but it has nevertheless attracted criticism from Tea Party groups. FreedomWorks has financed online ads and phone calls supporting Lynch; the Chamber of Commerce and Defending Main Street PAC (which is run by Joyce's predecessor in the House, former GOP Rep. Steve LaTourette) have spent big on behalf of the first-term incumbent. In eastern North Carolina, it's GOP incumbent Rep. Walter Jones who's looking over his shoulder. Jones faces a challenge from Taylor Griffin, a former Bush administration official who has been endorsed by Sarah Palin. There's no one else like Jones in the House: He's a social conservative with a libertarian streak, and strongly anti-war in a hawkish district. In the GOP conference, he's an outlier: Jones was one of only two House Republicans who backed Ron Paul for president in 2012. His outspoken criticism of the wars in Iraq and Afghanistan has cost him some support among local Republicans — Jones typically sees smaller margins of victory in his primaries than most of his House colleagues. This time around, in addition to facing a serious competitor in Griffin, Jones has had to withstand attack ads from the Emergency Committee for Israel, a neoconservative pro-Israel group, and Ending Spending Action Fund, a conservative superPAC. In an attempt to highlight his conservative bona fides, Jones has run a radio spot featuring an endorsement from Dot Helms, wife of the late GOP Sen. Jesse Helms.